In addition to the Bernard Gussow (1881-1957) piece from a previous blog, here are two more from Up From The City Streets: A Life of Alfred E. Smith. I searched the web and can't find any traces of these two pieces elsewhere, so you're likely seeing these here for the first time. On the left, Al Smith and his family lived at 25 Oliver Street for much of their lives, with the exception of the time they spent in the Governor's mansion in Albany, New York. On the right is Tammany Hall, the political stronghold of the late 19th and early 20th centuries. 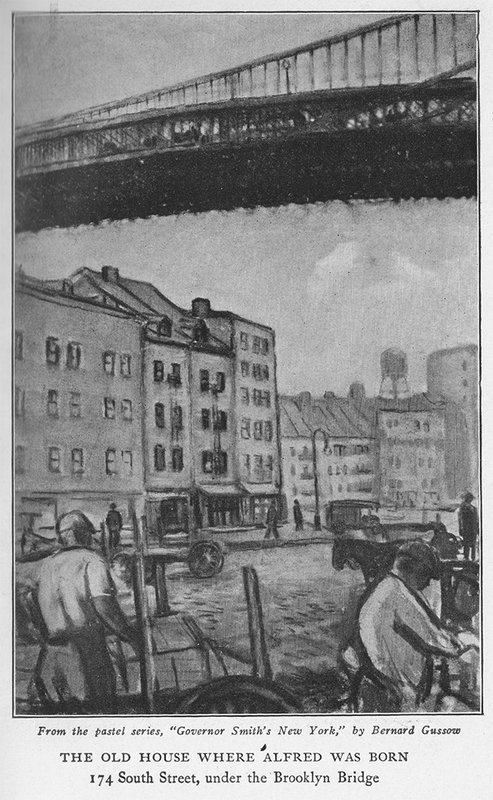 This page was scanned at a very high quality, and a black and white effect was added to remove the faded color of the now 90-year-old pages from the 1927 book. Up From The City Streets: A Life of Alfred E. Smith was first published in November 1927 by Grosset & Dunlap, one year before Governor Al Smith would lose the 1928 election after securing the Democratic nomination for President of the United States. While several of artist Bernard Gussow's (1881-1957) pieces are still available through art auctions and other websites, I was unable to locate this particular piece anywhere online, so here's a high quality scan from the book. This pastel piece was not included in my documentary, The Sidewalks of New York. Al Smith was born directly under the center of the Manhattan side of the Brooklyn Bridge's construction on December 30, 1873. The art was likely created in the 1920s. Watch my documentary The Sidewalks of New York to see the incredible story.